Spectravideo was the only american MSX manufacturer, but they were later bought back by their manufacturer based in Honk-Kong. For their first computers, the SV-318 and 328, Spectravideo asked naturally Microsoft to develop a Basic. Then, when Microsoft developped the MSX Basic, they used their previous work with Spectravideo. That's why there's always been a rumour saying that the SV-318 and 328 were MSX compatible. But that's wrong, the first Spectravideo MSX is truly the SVI-728. The SVI-728 is not really different from the other MSX 1, apart maybe from the keyboard which is very complete with its numeric keypad and also the fact that it was one of the first MSX to come with some serious extensions. Spectravideo also made a portable version of the SVI-728: the Spectravideo SVI-738. SVI-728 does have a very complete keyboard, but it's also probably the worst mechanical keyboard in history. It can be best described as putting your hands in to a pile of jelly and trying to type something. The build quality of this computer is also very poor when compared to Japanese MSX machines. The machine is mainly put together using hot glue. You can't even disconnect the keyboard from the mainboard because it has no connector, it's just soldered and glued in place! Some of the machines are also not 100% MSX compliant because they don't run Konami's MegaROM/SCC-soundchip games like they are supposed to. Some machines don't run these games at all and all the others have sound problems because SVI used a wrong type of condensator next to the machines sound chip. Because of this the PSG sound chip is so loud that Konami's SCC chip can't be heard. Replacing the condensator cures the problem. Another fact is that the machine actually has two cartridge ports, but the second port on the backside has a non-standard connector, so you can only connect SVI's own disk drive into it. The pin-outs are the same as in the regular port, though. Mmmm, the Australian SVI-728's must have been different that the Finnish ones. At the User Group meeting in Australia we had up to 100 or more happy SVI-728 users running just about every piece of MSX1 software porduced on cartridge, tape or floppy. I can't recall a single MSX title that didn't run correctly. I agree the machine was harder to dismantle than than the Sony HitBit or Toshiba equivalents but hey, they had nowhere near the peripheral support and who wanted to pull apart thier machine anyway? And once again I would have to disagree about the keyboard. 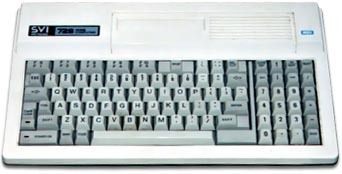 I still have my SVI-728 at home and its keyboard feel is equivalent to this Microsoft keyboard I am typing this with. see more Spectravideo SVI 728 Ebay auctions !